Help! There is water in my home. What do I do? First, figure out where the water is coming from and turn off the source off water. Second, call Insurance Resource of Michigan. We will help route you to a restoration company. The restoration company will clean up the water and prevent further damage from happening. Does my insurance cover this damage? Water backing up or overflowing through a sump pump, inside drain or sewer into the home, would be covered under a water back up endorsement. Water back up is an optional endorsement on your home policy. Coverage starts at $2,500; however, a finished basement clean-up (not repair) can run $5,000 – $10,000. Water coming into your home from a standing source or an outdoor drain overflowing is considered flood. 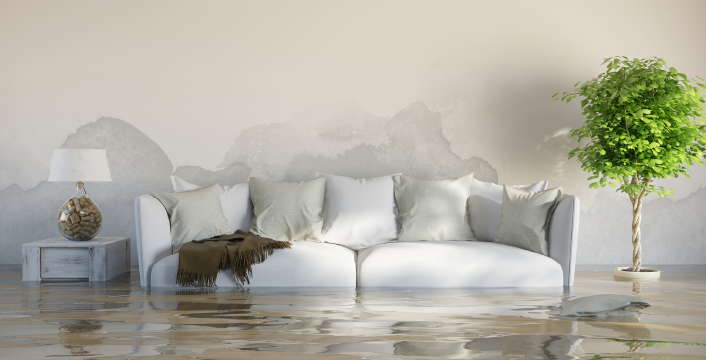 Flood is not covered under a home policy and would need a flood policy which we can write for you under the National Flood Insurance Program. Water from a leaking or burst pipe is covered (up to your policy limit), if it is sudden and accidental. If it is considered maintenance or general wear and tear, then there is no coverage. Examples are refrigerator or dishwasher leaks, or your toilet or bathtub overflows. Ice, snow or sleet that causes the roof to collapse or water damage can be covered (up to the policy limit). However; if the roof is showing general wear and tear or maintenance work needed, this could prevent coverage reimbursement. The restoration company removes the water, dries all wet carpets, rugs and personal belongings. The professional water mitigation company will also help sanitize, dry and prevent mold growth. Maintain gutters and downspouts. Keep them free of debris and repair when sagging occurs. Inspect the capacity of your gutters after fifteen minutes of heavy rain. If water overflows the gutters, install additional downspouts. Extend downspouts at least ten feet away from the house. Adjust landscaping and irrigation so that water flows away from the foundation of your home. Drain subsurface groundwater and storm water with a sump pump system that has battery backup and replacement warnings. Run your sump pump every few months and clean it annually before the rainy season. Prevent backflow of sewer water by installing backflow valves and standpipes at all basement drain locations, including sinks and toilets. Prepare your basement by raising your washer, dryer, water heater, oil tank, furnace, all electrical wiring and personal items above typical water backup level. Seriously plenty of superb facts! Cheers. Quite a lot of postings. Very good facts. Thank you! Incredible tons of superb knowledge! Amazing quite a lot of terrific data! Thanks! Quite a lot of advice! Kudos, A good amount of data! Wow many of amazing information.